I’m looking forward to the new reward program! I wish it would start sooner! (*Except where I have made an agreement with Starbucks not to discuss a particular topic, which did not happen here. It did happen back in 2012 with the last major rewards change). Be a guest blogger on StarbucksMelody.com (or TeavanaMelody.com). Canada gets a beautiful maple leaf Starbucks card; The U.S. now has over 3 million gold card holders. Did you get your My Starbucks Rewards coupon for a free tall Frappuccino? I think the multiplier from old MSR to new MSR at 11 is pretty fair. Since I am in a middle of a star dash right now I might just complete it. You had mentioned what the average ticket size was before, but anyone spending $5.21 or more on average per trip will benefit. I don’t so I will probably continue to shift spending to at-home coffee, purchased on double star days to keep the Gold benefit. @CalWatch – Oh yes. The rolling stars thing confuses me too. It prevents people from very slowly early rewards and it is different than many other industries. Stars expire at 6 months. So someone who has 100 stars for a reward in February, then 6 months and one day (later in August that year) picks up the other 25 stars wouldn’t have a free reward, because the first 100 expired. It is unique and will vex those who have long breaks in their star earning and/or for one reason or another just tend to slowly earn stars. The rolling stars seems to be a compromise around expiring earned rewards. Under the new program, you don’t really earn rewards, you redeem stars for rewards. So whenever you choose, you just trade-in your oldest 125 stars for a reward at the register. That prevents the cases where people forget to redeem a reward before it expires. Let’s hope that Starbucks is not “fool” enough to start this on April 1 (April Fools Day). In fact even starting it anytime in the month of April could be considered a “fool”. I predict that Starbucks is in for a surprise, this “system” is going to be harder to manage and there will be as many, if not more complaints. First I can see is the allocation of points for fractional dollar purchases. Too often Starbucks has not followed common sense and good business practices, so be prepared. KISS and watch out when you fully open this bag of worms, what the right hand giveth the left hand takes away. I was not aware of the rolling stars . So does that mean our rewards technically now last up to 6 months instead of about 5 weeks.? If so sounds very good. I was talking to a manager today who realized I had bought a few $200 key chains during the holidays tell me instead of the 1 star I earned I would now earn 430 instead. 3 automatic rewards, not too bad. It looks like it will take one approximately two more Grande Drip coffees to get a reward than before. To me this is a net loss for those who buy cheap drinks regularly and a gain for those who tend buy more expensive drinks, a drink and a food item, or multiple drinks. None of the changes benefit me or anyone spending less than $5 per visit in any way. Why didn’t they simply tie money spent to redemption dollars? For example, if I spent $24 that would entitle me to $2.40 in credits. Spend more you get more – seems fair and easy to understand. Seems to work great for Kroger and gas points. Why in the world would I ever use this new program? Buy 30 coffees get one free? This really comes across as very very underhanded in the way that Starbucks is positioning this new program. No one likes to have someone pee on their leg and tell them it’s raining. One can be certain this change is designed to reduce the cost of the rewards program, not respond to any demand for program “improvement” from customers. Specifically, as someone else here pointed out, anyone who spends less than $5 per visit will earn substantially fewer rewards. This hits the “morning Venti Pike” people the hardest — they go from one free coffee every 12 visits to one every 63 visits. So it’s more like “buy 62 coffees, get one free”. Secondly, it skims off all the reward payables represented by the amount above the nearest whole dollar — a substantial savings to Starbucks writ large across millions of purchases. If your drink of choice costs $2.91, as does mine, that purchase represents two stars out of 125, or 1.6% of a reward, versus the current 1/12, or 8.3% of a reward. Put another way, my daily reward progress is reduced by approximately 80%. This isn’t going to leave a great taste in the mouth of someone who visits Starbucks 250 times a year. This scheme reminds me of when all the yogurt companies suddenly decided, in lock-step, to reduce the amount of product in a cup to six ounces, from eight. Dannon emblazoned their new cups with a burst stating “NEW! More room for mix-ins!”. Because, you know, there’s nothing a customer wants more than less of the product they’re purchasing. Rum, you’re mistaken about a couple of items. First, your daily drink of choice, at $2.91 gives you 5.82 stars per purchase, or 4.66% of your reward. So they won’t show you the fractional stars, but they will accrue them for you as you go, so there’s no skimming involved here, perhaps if you had read the FAQ’s that Starbucks had posted, you wouldn’t have jumped to conclusions. As for the yogurt analogy, that’s just ridiculous. Every retailer gives better rewards to those who spend more money on a regular basis. Just because you fly coach every week doesn’t mean you’ve earned First Class upgrades. But start flying First Class once a month, and see how the rewards miles pile up. I’m a drip coffee drinker, so I’m someone who loses out on this as well, but I’m in the rewards program mostly for the free refills, the extras are just that – an extra bonus. Customers wanted to earn a star PER ITEM PURCHASED, not PER DOLLAR SPENT! Starbucks is manipulating survey data to gouge their customers. There is absolutely no way customers were requesting to pay more and receive less!!! Starbucks should be ashamed of themselves! Dane — I wish they would release the raw survey data so we can see for ourselves, but I don’t doubt that stars per dollar spent was a common request, especially for people who regularly buy bags of coffee beans (1/2 pound of reserve beans for $18+… old plan got you 2 stars, new plan 36 stars) or of course any of their overpriced desserts in a cup ($5+ venti frap with customizations, 1 star old, 10 stars new). If a large number of respondents asked for it, what more can we say. But I do agree that they did go too far, in that now they’re punishing loyal customers who don’t buy coffee beans nor expensive dessert drinks. Like an airline (here’s looking at you, Delta) that for years gave you a free flight anywhere in North America for every 25,000 miles flown, then decided to change it so that now you need 27,000 miles to fly on a puddle jumper and 40,000 miles to fly coast to coast. I finally hit the magical 25,000+ mile level and was ready to book a trip to California, and you can imagine the colorful language that came out my mouth when I saw that suddenly I needed 40,000. That’s how I feel about the new Starbucks Rewards. I give you my loyalty and you slap me across the face for my trouble. I haven’t flown Delta since. Starbucks – you might be next. Chris: I agree with many of your points but you’re mistaken on the airline analogy. Airlines passengers earn first or business class travel from economy class travel in a number of ways. For example, Delta and United grant status based on the number of miles flown, and then based on your status you qualify for free unlimited domestic upgrades. In the case of American, you earn 500 mile upgrades based on the number of miles flown (that are then redeemed for upgrades.) Of course, passengers also earn miles for their flights (now based primarily on spend) but if you spend enough on tickets (economy or otherwise) you will earn miles that can be redeemed for upgrades from economy tickets or for premium cabin tickets. I certainly have rarely paid for a anything than a coach ticket (maybe twice?) but frequently cash in my American earned upgrades or have been upgraded based on status of myself or others — all on economy fares. Similarly, I have redeemed my miles (primarily earned on economy fares) for premium cabin awards. I haven’t sworn off any airline due to their shift to revenue-based earning, I just cleared Gold with AA last year but feel no need to try and hit Platnium again. Similarly, I will continue to be a Starbucks customer (even a gold customer) and my per-transaction rate will go up, but my overall spend will be about 25 percent of where it is now and I will be in a cafe far less often to make an impulse purchase of an additional pastry or sandwich. There are just too many other options, many of which have a reward even for the daily drip customer. As a Canadian Starbucks patron, the new rewards program may be better than American patrons because our drink and merchandise prices are high to begin with due to the exchange rate. A short coffee is $1.90 on Vancouver Island. Given that we are going to earn the same 2* for every $1, I would be earning my stars faster if I were in the US. Brian – my rewards account is Canadian while my wife’s is American. What we have found is, currency exchanges occur on the account balances but not on the stars calculation. So if she buys a $2 drink in Canada using her U.S. card, her account will show $1.45), however, if a promo required her to spend $10 on a visit to get bonus stars, she still would get those stars despite her account only showing a $7.30 debit. And she has used that to her advantage many times. So under the new program, it remains to be seen if her $2 purchase in Canada gives her 4 stars (based on the Canadian dollar value) or 2.9 stars (based on the U.S. dollar value). What I can tell you is there really is no significant difference in the kinds of promos we each get, but it’s been nice having one card for each country. She doesn’t like coffee at all so if she gets a bonus star promo for, say, flat whites, she’ll buy me the drink, and if I get a promo for Oprah chai tea lattes (which she likes) I’ll buy her the drink. Curiously, the current “Star Dash” promo requires 7 visits for me (Canadian) but 8 for her (American) to get the 15 bonus stars. Hua – I haven’t officially “sworn off” Delta but I no longer use them exclusively, and for my last few trips I found better airfares and schedules with other carriers; had I been able to redeem my 25k miles for a free trip I might have continued with my exclusivity rather than try jetBlue, Southwest, and British. This time it looks like Delta is beating the others on price for a trip I will be taking so I may well fly them again. Just like I will do with Starbucks – under the new plan I will only go there when I feel it is advantageous (double stars, BOGO, half price, etc) , whereas under the old plan (still) go because the conditions worked in my favor given my spending patterns there. Tex – Thanks for your solution regarding the 36 shot drink. I can appreciate the logic and drive behind your effort but I don’t know if I would actually do that! In terms of airlines, I sort of dropped United first (due to too many bad experiences and indifferent employees), Delta next (since American/US offered a mileage-based program), and now I’m left with AA going revenue based but at least they don’t have a spending minimum to hit status and their merger with US seems to have gone fairly smoothly. AA will continue to be my preferred carrier as long as I have some eligibility to ease the pain (a free bag, access to Main Cabin Extra seats, pre-boarding, eligibility for upgrades even if I’m at the bottom of the pecking order) but I would have to weigh the perks in light of a substantial fare difference. Fortunately, I have found that AA has been fairly aggressive in matching the Spirit and Frontier fares so usually the price is about equal and I don’t have to calculate the cost of things like seat assignments and carry-on bags. Anyhow, it sounds like we have a similar mindset regarding the cost/benefit calculation of rewards and loyalty. I will miss my daily visits and I don’t blame Starbucks for making the decision to focus on the bottom line, but loyalty is a two way street — Starbucks is doing what’s best for their balance sheet and I will do the same. Actually, that is exactly how you’ve earned upgrades to first. And if you do it enough, you can even earn free first class tickets. Take a look at aa.com under AAdvantage. Wigmore – I thought so too. Anybody can earn a free First Class upgrade, but you’ll get them a hell of a lot faster if you already fly First or Business class or pay for refundable tickets (which usually are double the refundable price). Which brings us back to Starbucks – under the new system, you’ll get your reward a hell of a lot faster if you spend more — $10 fraps, $20 bags of Reserve beans, $100 Verismo machines, etc. You’ll take a long time if your usual spend is a $2 tall dark roast. Hua – I may be looking for the best price but I also have my standards. I would never fly Spirit, Ryan, Allegiant or any of the other nickel-and-dime-you-to-death cheap airlines (and here in Canada we have Transat and Sunwing, almost as bad). I am surprised AA would even bother price-matching Spirit, totally different market. To me that would be like Starbucks price-matching Tim Hortons, Dunkin Donuts, or 7-Eleven on coffee, again totally different market. “…we have a similar mindset regarding the cost/benefit calculation of rewards and loyalty […] loyalty is a two way street — Starbucks is doing what’s best for their balance sheet and I will do the same.” Couldn’t have said it better myself. I don’t need overpriced candy in a cup, if I want Dairy Queen I know where it is. With my Cuisinart burr grinder, Verismo (bought for almost nothing at a store’s out-of-business liquidation sale), multiple sizes of French presses, moka pot, Krups espresso machine (which I haven’t used in ages), and ibrik I can make whatever coffee drink I want for a lot less than Starbucks charges. And yes I know you can buy competitor’s pods that work in a Verismo, which I’ll also be shopping for…. I will also be using coffeereview.com to look for better coffees than that over-hyped “Reserve” stuff, at better prices. I usually go in for a venti Pike, which costs a little less than $3. That would yield about a free drink every $36. Now, I have to spend about 75% more to enjoy my reward. Starbucks is playing with our minds, making us think more stars are better, where in reality, more stars simply mean more money for them. Which makes perfect sense. The real rewards in this new program are going to the corporation/shareholders, not the customers. Maybe they should have renamed it “SBUX’s Rewards”. See the first one, the Affogato Frappuccino? But I kick it up notches previously unknown… I ask them to make it with 6 scoops of vanilla powder (so it actually tastes of vanilla) and 10 ristretto shots. The end result is a huge cup of vanilla bean soft serve ice cream doused with coffee. With the new “rolling” stars scheme, does this essentially mean that we only have 6 months to earn our gold status now? If our stars start dropping off at 6 months (or expiring), how does this comport with earning 300 stars in a year or are we only going to be punished once we reach gold status? Before you’re at gold status, it doesn’t really matter if you’re stars expire because you can’t redeem them. As long as you get the 300 stars in 12 months, you get to gold and can start earning rewards. The six month expiry is actually a better deal than what we have now, unless you’re extremely slow at earning stars. Right now, once you earn 12 stars it converts to a reward that expires in about a month. With the new program, you’ll have six months to redeem stars. So, if you earn 125 stars in one month, you’ll then have an additional 5 months to redeem them. Not including bonus offers, 125 equates to $62.50. 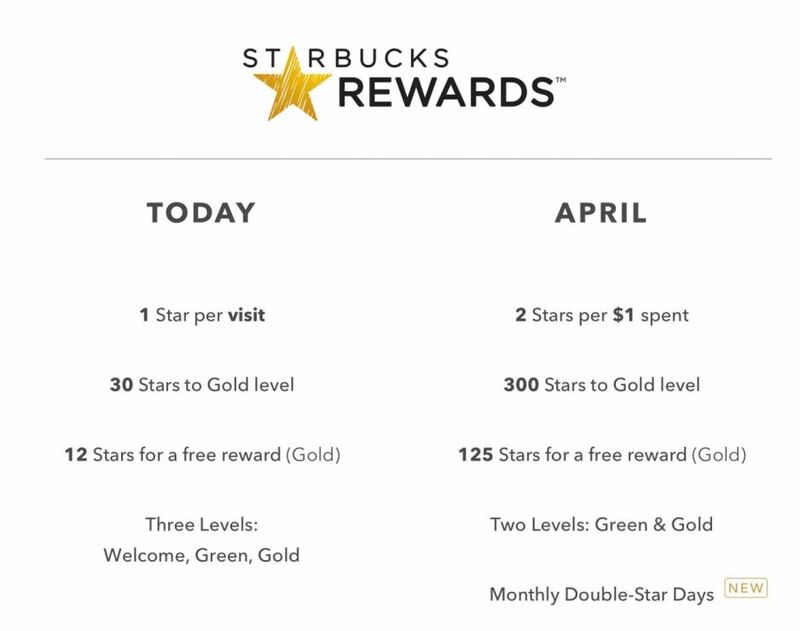 Unless you’re spending less than $10.42 a month at Starbucks (which means you won’t be able to reach/retain gold level in a year anyway), there should be no problem for someone to earn a reward within six months and still have time to redeem it before the oldest stars expire. Rather than repeat what so many people have said, I have mixed feelings about this new reward program and am not sure it will work to the customer’s advantage. Like they do with drinks or food I think they should give this new program a test run and see how it works. Joyce – I am certain Starbucks’ marketing and accounting people have run myriad calculations to determine what changes they can get away with that will still increase revenue/profits for them. And included in those calculations is churn (how many customers they lose as a result). Put simply, I suspect churn will rise but since they give out fewer rewards per dollar spent and they keep the high-value customers, end result is revenue goes up. The airlines have been doing it for years (and at a worsening rate since 9/11); there’s no way airlines run like present-day Spirit or Ryanair would have survived in their current form in the 90’s. But by slowly whittling away at expenses without losing too many customers in the process, after several rounds of that over several years you see where we are now. Starbucks is going that route. I’m sorry to see the change. A star per swipe made the rewards program distinctive. The change turns it into a rewards program just like any other, e.g. Dunkin Donuts. What’ll happen at grocery stores? I can buy a dozen eggs along with my coffee with my rewards card and get one star. Will I now be able to bring a full cart of groceries to the Starbucks register to get points for everything? This change would require me spending more than 25% more each time I buy a cup of coffee. I’m not sure if even going from a tall to a venti will do that and I’m absolutely not going to buy a size that is much more than I want to drink. Looks like the new SR kicks in on April 12. So you want to have exactly 11 old stars at the close of business on the 11th. Jo – I don’t think we are getting a 5 month extension on redeeming our reward once earned. My take is that once you hit the 125 stars, it converts to a reward. Consistent with the current scheme, you then have 30 days to use it or lose it. Similar to complaints on the “other” thread regarding the new reward scheme, I am a fits-and-starts user. Since there is no SBX “close to home,” my purchases are linked to the volunteer work that I do. When there is an event, my purchases skyrocket as I treat fellow volunteers (yes, the new plan will make my generosity easier and more rewarding with the $/star scheme vs. $/purchase). But at the same time, I risk losing those earned stars when I don’t frequent SBX if I’m not in the mood, budgeting, or dieting. 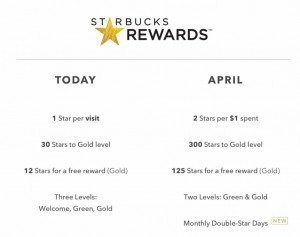 Doesn’t sound like the “New Coke” marketing for Starbucks Rewards is going over well at Mystarbucksidea.com. Perhaps they’ll come up with a new drink – the “edsel”? The current rewards program is all about simplicity and fun for me. 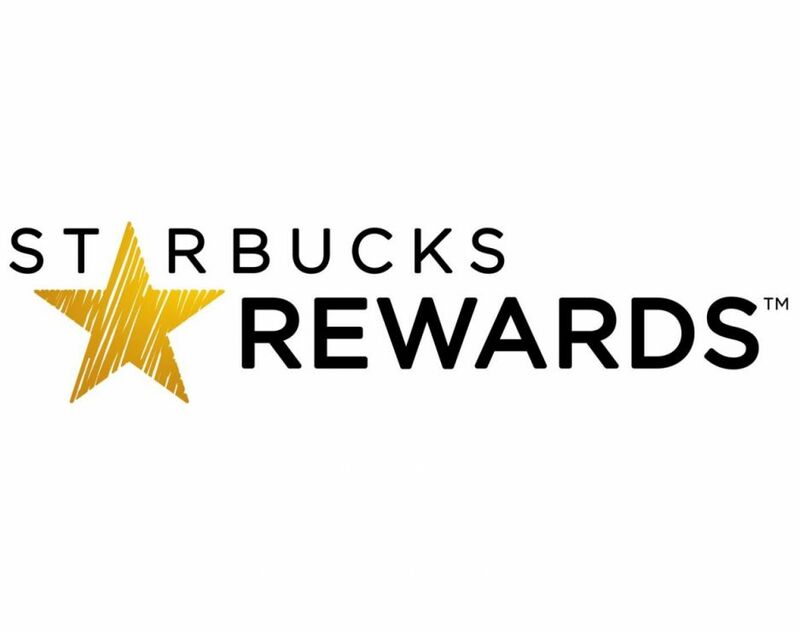 Heck, I don’t even redeem many of my rewards because: I like drip coffees as much or more than the expensive drinks; I don’t want to ‘waste” a reward on an inexpensive drink; and I like getting to 12 but redeeming a reward means my visit doesn’t get me a star. Now maybe that makes no sense in terms of math, but counting to 12 was part of the Starbucks experience. Counting to 125 is not the same. I wonder if there will be some way to tell how old the oldest stars are. Like a note saying “Your oldest star(s) will expire Aug 15, 2016”, or do they just expect people to use their stars as soon as they get to 125 (which it kind of sounded like from some of the phrasing in the FAQ). Read some more of the FAQ and apparently there is a reminder email about expiring, though I still wonder if the app will have a note somewhere. Starbucks will send a reminder email to notify you when you’ve earned 125 Stars. The Stars you earn as a Gold member will expire 6 months after the month in which they were earned. Starbucks will send a reminder email to notify you of the number of Stars they have expiring. Starbucks will always apply the oldest Stars towards your Star Reward (redeemed with 125 Stars).